I am as vulnerable to the hype of the new as your next essayist. I put on a brave face about staying current. I erratically strive to be your, and anyone's, source for the hottest new undiscovered genius. I try hard sometimes to carry that restless, sizzling energy of a person surfing the waves of zeitgeist. It's cool. Oh how cool it is! I was spoon fed on cool. And so often it is irresistible to me. But my heart is not in it. Sure, I am a cultural omnivore. I'll try anything. Working at a Library is like standing on the banks of some great, mythical river, where all stories, songs and ideas float through on the relentless current. I scrabble around, dive in, and look for and at everything. But I have neither the discipline, energy or dedication to categorize, to stay on top of it, to be ever attuned to primarily the newest treasures. In my deepest heart I am not a discoverer, an advocate, a culler of the waters. I am a feaster, a sensualist, a devourer of dreams. I like my culture tenderized, aged, with its edges rounded into beautiful harmony by wind and rain, ice and heat. I like the mellow flavors to deepen. I like its interrelations with everything around it to have time to seep in and resonate. I like a dash of historical context, which, like salt, illuminates the native flavors. I like my culture pulled from the fires of fad and thrilling discovery, where it has either burnt to a crisp and need not be troubled with, or has browned, caramelized, smoked, and then cooled to the touch. Warm now, with it's own magical, carried, internal heat it may lack some of its earlier thrills and dazzlement, but its depths are now endless, its flavors capable of the most profound resonance, and its beauty quieted enough to register in every range. I am ever on the lookout for some glorious new art, and am always delighted to hear truly passionate suggestions from my friends, colleagues, and associates. As I said, I'll try just about anything, but a recommendation of Piazzolla's Tango: Zero Hour (1986) or the animal paintings of Bruno Liljefors (1860-1939) is racing to the top of my list, whereas a hot tip on the best new novel that is releasing in only a week or two I may or may not get to right away. It can wait. 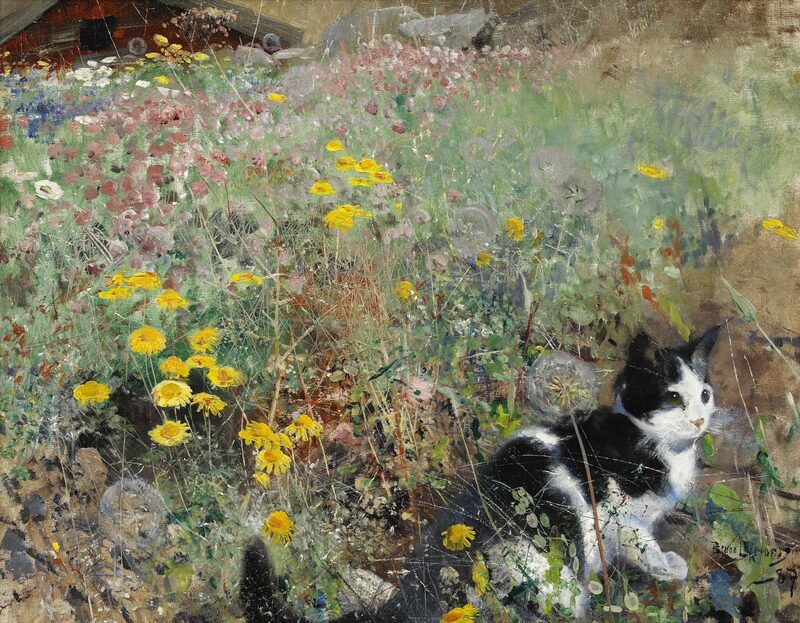 OMG, is that kitty painting a Bruno Liljefors? I'm smitten!